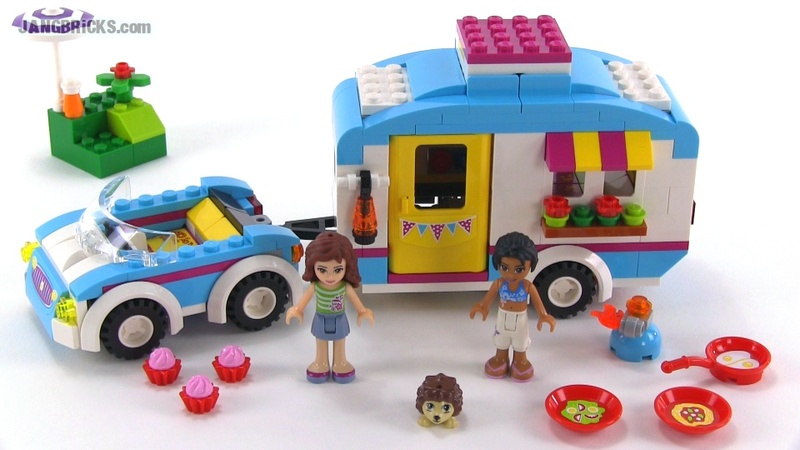 Camp out in the countryside with the LEGO® Friends Summer Caravan! Head off on a summer camping trip with the LEGO® Friends! Olivia and Joanna have a brand new car and caravan and are looking for the perfect spot outside Heartlake City to set up camp in the sunshine. Help them prepare a delicious lunch on the camping stove and sit down to eat at the table and chairs. Sit back and admire the beautiful view while saying hello to the friendly hedgehog. Then wash the dishes before setting up the sunbeds and switch on the MP3 player for an afternoon of sunbathing – don’t forget to make sure everyone is wearing sunscreen. Freshen up in the shower then settle down for the night, but not before sharing some secrets by lamplight!